3. Which of the following statement is not correctly matched? This entry was posted on December 28, 2007 at 1:14 pm and is filed under Questions - IAS Prelim, Quiz - IAS General Studies, Quiz Current Affair, QUIZ IAS General Stuides, UPSC. You can follow any responses to this entry through the RSS 2.0 feed. You can leave a response, or trackback from your own site. 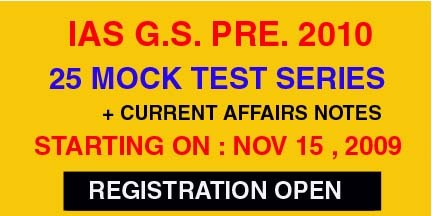 its a very good website.can i have more online sample test papers for current affairs (07-08)..